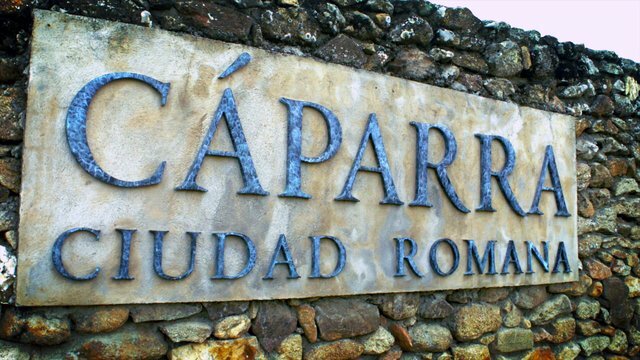 The intriguing site of Cáparra lies a few kilometres out of Plasencia, in the municipality of Oliva de Plasencia, within the Caceres region. Under Roman rule, this city would become an important communications hub along the north-south axis between Emérita Augusta (Merida) and Artúrica Augusta (Astorga), which forms the Silver Way. Its strategic position guaranteed its preferential treatment amongst the Roman municipia of Lusitania, fuelling its growth and the gradual building of monuments, which are now evident in the archaeological remains. Cáparra was totally fortified, and had three gates, positioned in the south-east, east and west. There were two main thoroughfares in the city, the cardo and the decumano. The latter ran along the Silver Way as it ran through the town, and its far ends ran from the Eastern to the Western gates. You can visit the site, using an itinerary which begins at the visitors' centre, in one of the three necropolis buildings which have been discovered to date. Afterwards, the route will take you to the remains of the amphitheatre and the South-West Gate. In the centre of the site lies the Cáparra arch. This arch, which is the undisputed symbol of the city, dates from 100 A.D. and has four arches which are sustained by four pillars, creating a four-fronted arch structure which is unique in the Iberian Peninsula. The arch opens out on to the forum, an open space which was the town's political and religious centre. In it you can still see the remains of the main buildings: the basilica, the papal curia and another three temples. Next to the arch and the forum are the hot springs, also at the foot of the two main thoroughfares. Here you can see the hot water piping system, the exercise ring, and the shops or tabernae, adjacent to the building and open to the decumano.